Irish Roots magazine is a celebration of Irish ancestry, heritage, culture and traditions! 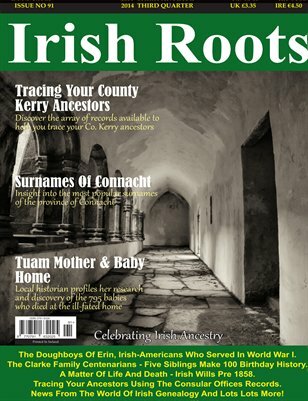 In this issue:- Tracing Your Co. Kerry Ancestors. Surnames Of Connacht - The history and further insight into surnames from this province. Tuam Mother & Baby Home - Local Historian profiles her research and discovery of the 795 babies who died at the ill-fated home. The Doughboys of Erin - Irish Americans who served in WW1. The Clarke Family Centenarians - Five Siblings Make 100 Birthday History. A Matter Of Life And Death - Irish Wills Pre 1858. Tracing Your Ancestors Using The Consular Offices Records. News From The World Of Irish Genealogy And Lots Lots More!